ProbioSupreme™ 30 is a vegetarian, dairy- and gluten-free, four-strain probiotic totaling 30 billion CFU† per capsule. Each vegetarian capsule is sealed in nitrogen-purged aluminum blister packs to serve as protection from factors proven to compromise the stability of probiotics such as heat, moisture, and oxygen. 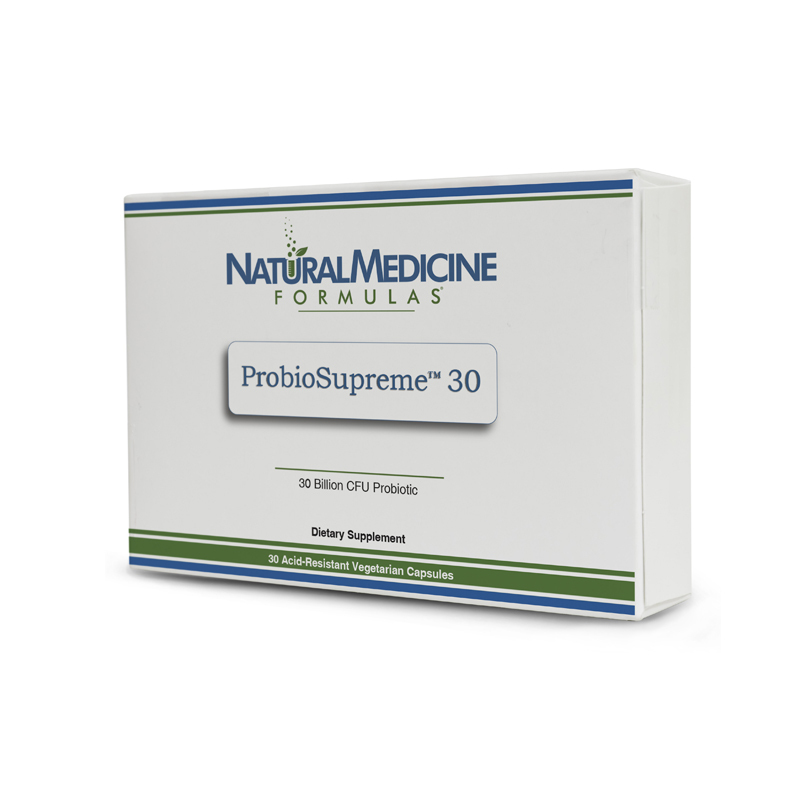 ProbioSupreme™ 30 provides four researched strains of beneficial bacteria, including the extensively studied HN019 strain of Bifidobacterium lactis. These live microorganisms have proven health benefits and well-established safety, and have been tested for epithelial cell adhesion and/or resistance to low pH. No auto-ship. Make this a one time purchase. DIRECTIONS: Take one capsule with water daily, or as directed by your healthcare practitioner. Common challenges associated with probiotic supplementation are maintaining stability of the organisms during distribution and shelf life and, once taken by a consumer, survival of the organisms as they travel through the digestive tract so that they reach the target tissue (intestines) alive. To help ensure stability, Natural Medicine Formulas packages the ProbioSupreme DF capsules in sealed, nitrogen-purged aluminum blister packs to serve as protection from factors proven to compromise the stability of probiotics, such as heat, moisture, and oxygen. Careful selection of organisms is another way Natural Medicine Formulas helps ensure stability. Careful organism selection, as performed for ProbioSupreme DF, is also a critical aspect of supporting digestive survival. To further support resistance to low pH and the delivery of microorganisms to the small intestines, Natural Medicine Formulas employs DRcaps™ gastro-resistant capsules. These specially designed, innovative capsules help slow exposure of actives to stomach acid to promote a more targeted release. HOWARU™ (Bifidobacterium lactis HN019) Discovered in 1899, B lactis play a key role in the human microflora throughout a person’s life. Researchers have identified strain HN019 as having excellent probiotic potential based upon its ability to survive the transit through the human gastrointestinal tract, adhere to epithelial cells, and proliferate. B lactis HN019 has been extensively studied, and its safety and effectiveness is well accepted. [7,8] To assess the impact of Bifidobacterium lactis HN019 supplementation on whole-gut transit time in adults, 100 subjects were given daily doses for 14 days of 17.2 billion colony-forming units (CFU), 1.8 billion CFU, or placebo. Decreases in mean whole-gut transit time over the 14-day study period were statistically significant in the high-dose group and the low-dose group, but not in the placebo group. This level of dosing also supported other parameters of healthy GI function, as were self-reported by patient survey. In another study of preschool-age children, supplementing milk for one year with 1.9 x 10 CFU per day B lactis HN019 and 2.4 g/day of prebiotic oligosaccharides supported both healthy iron status and weight gain. In a randomized, double-blind, placebo-controlled human dietary intervention study in elderly subjects (>60 yrs. ), supplementary B lactis HN019 resulted in statistically significant increases in the beneficial organisms bifidobacteria and lactobacilli. 6. Gopal P, et al. Effects of the consumption of Bifidobacterium lactis HN019 (DR10TM) and galacto-oligosaccharides on the microflora of the gastrointestinal tract in human subjects. Nutr. Res. 2003;23:1313-28. http://www.daniscosupplements.com/clinical-study-bibliography.html. Accessed June 24, 2011. Stay informed of upcoming events and promotions while learning some great health information! Serving the communities of: Palm Beach Gardens, North Palm Beach, Jupiter, Tequesta, Singer Island and West Palm Beach.